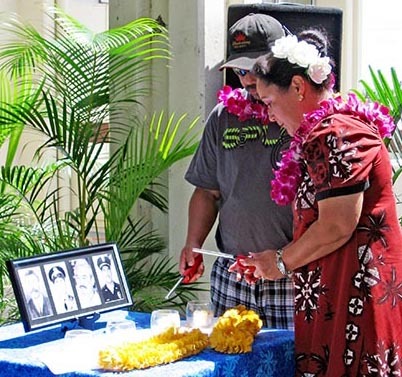 Daniel Oili and Raynette Taketa, descendants of William "Red" Oili, light candles in his honor and for three other Big Island police officers who have been killed in the line of duty since 1918. 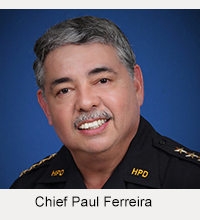 Members of the public helped the Hawaiʻi Police Department celebrate Police Week on Monday (May 16) at the Hilo police station. The outdoor ceremony honored four Big Island police officers killed in the line of duty: Manuel Cadinha (1918), William “Red” Oili (1936), Ronald “Shige” Jitchaku (1990), and Kenneth Keliipio (1997). 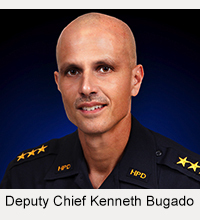 Police Week is a nationally recognized week of activities in support of police work and in recognition of officers who have died or been disabled in the line of duty. In 1962, President John F. Kennedy proclaimed every May 15th as Peace Officers Memorial Day and the week it falls in as Police Week. A similar ceremony was held Tuesday (May 17) in Kona.